Do I look like a cartoon to you? No, I do not. That would be a correct answer on your part. Do you see a cartoon anywhere in this blog post? No, you do not. 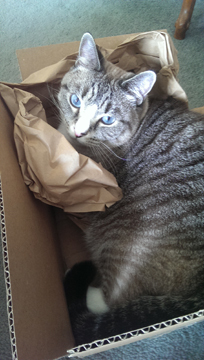 Well, I talked myself blue in the face trying to talk her out of the week off, but I finally reverted to my box and napped the rest of the week. Cartoons will be back next week. Thanks goodness… Can’t keep all this cuteness to ourselves. We just might explode with whimsy. 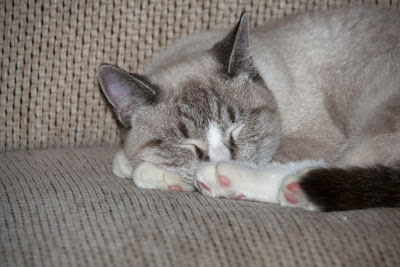 Now for the Sunday Selfie… I guess I’ve worked the hardest at napping so here’s a selfie of me sleeping. 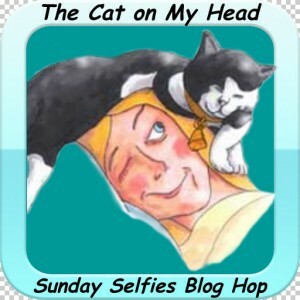 We are participating in the Sunday Selfie Blog Hope put on by The Cat on My Head blog. Join in. This entry was posted in Uncategorized and tagged art, bugsy, cat, cats, Double Trouble, feline art, humor, Knuckles, Lou Belcher, Sunday Funnies, whimsy. Bookmark the permalink. Sleeping selfies are the best! You’re right. Bugsy likes to sleep through everything except treats. We love your sleepy selfie, Bugsy. Thanks for dropping by… So good to see you. hugs!!! Yes, we do wear ourselves out watching her! MOL Thanks for coming by. That is a very cute sleepy selfie. Thanks… I do work hard at being cute…. Ha!!! You are so cute, land I see you haven’t changed any either. Sorry I’ve been missing for so long.Same ole story here. Congratulations to HH on the new book.